There are innumerable uses for our Elisee Shaker Pottery Pantry with its hardwood backsplash, display case, enclosed cabinets, and dovetailed drawers. The simple elegance of our Elisee Shaker Pottery Pantry is more than enough to bring a new spark of life to your dining room or entertaining space. Enjoy the day to day luxury of genuine solid wood Amish craftsmanship because this handmade pottery pantry is designed to stand the tests of time. 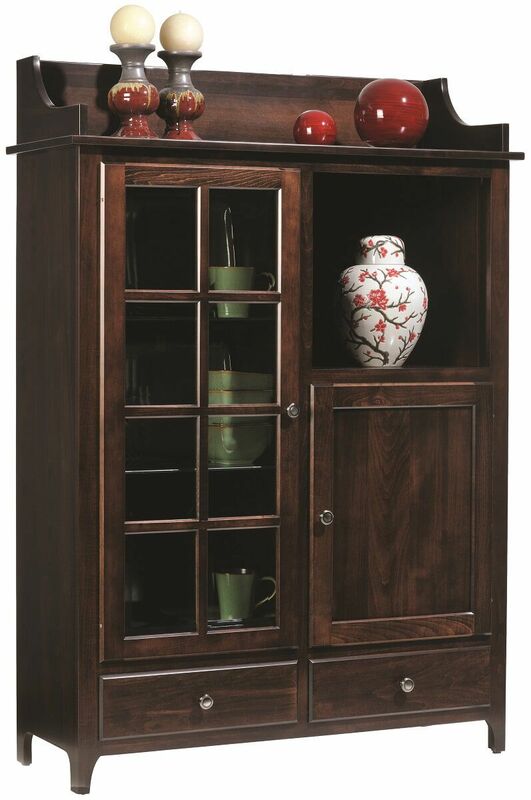 With a beveled glass mullion door, elegant display lighting, and plenty of space for showing off your fine dinnerware, this Elisee Shaker Pottery Pantry is sure to please. Order in Brown Maple as pictured, or create your own wood and stain combination by requesting samples at checkout.